‘I know no place where firm and paternal government would sooner produce beneficial results then in the Solomons … Here is an object worthy indeed the devotion of one’s life’. Charles Morris Woodford devoted his working life to pursuing this dream, becoming the first British Resident Commissioner in 1897 and remaining in office until 1915, establishing the colonial state almost singlehandedly. His career in the Pacific extended beyond the Solomon Islands. He worked briefly for the Western Pacific High Commission in Fiji, was a temporary consul in Samoa, and travelled as a Government Agent on a small labour vessel returning indentured workers to the Gilbert Islands. As an independent naturalist he made three successful expeditions to the islands, and even climbed Mt Popomanaseu, the highest mountain in Guadalcanal. However, his natural history collection of over 20,000 specimens, held by the British Museum of Natural History, has not been comprehensively examined. The British Solomon Islands Protectorate was established in order to control the Pacific Labour Trade and to counter possible expansion by French and German colonialists. It remaining an impoverished, largely neglected protectorate in the Western Pacific whose economic importance was large-scale copra production, with its copra considered the second-worst in the world. 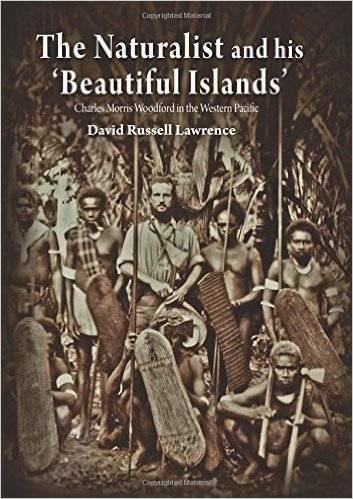 This book is a study of Woodford, the man, and what drove his desire to establish a colonial protectorate in the Solomon Islands. In doing so, it also addresses ongoing issues: not so much why the independent state broke down, but how imperfectly it was put together in the first place. David Russell Lawrence is an anthropologist who has managed environmental programs in Melanesia and Southeast Asia for the Great Barrier Reef Marine Park Authority. His most recent book was a re-examination of the place in Melanesian anthropology of the Finnish sociologist Gunnar Landtman who spent two years working with the Kiwai people of the lower Fly estuary. He recently managed a large-scale survey of 300 communities in the Solomon Islands for the Community Sector Program and has assisted with a number of the annual RAMSI People’s Surveys in the islands. This work has given him insight into the colonial heritage of the Solomon Islands and a desire to tell the story of the establishment of the British Solomon Islands Protectorate through the eyes of the first Resident Commissioner, Charles Morris Woodford.